Me? I worry first about what the food options are, then I consider those other things. *Alright, my consideration of their shopping scene is close, very very close to food. That said, I was meticulous in choosing my options for breakfast, lunch, and dinner for each day in Stowe. 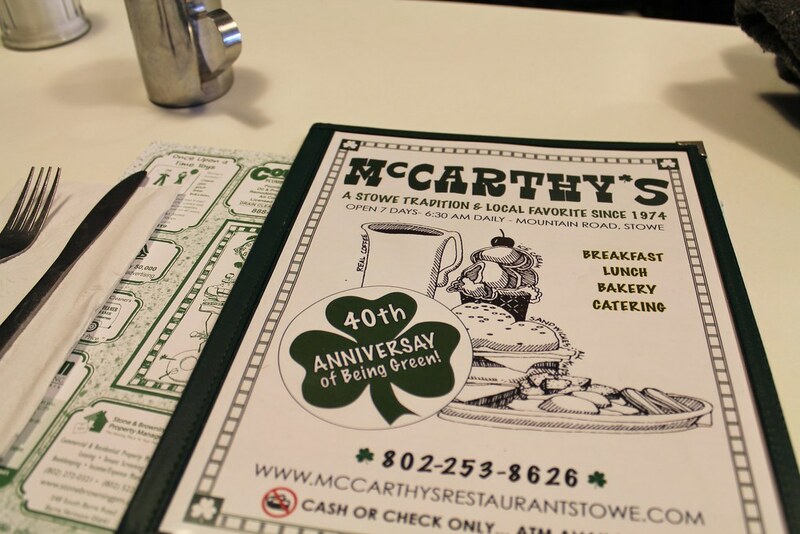 One local breakfast joint that kept popping up as a favorite was McCarthy’s. As soon as we walked in, I knew the reviews weren’t joking about not only McCarthy’s popularity, but the deliciousness of their breakfast items as well. We had around a ten minute wait in their gift shop before the hostess asked if we minded sitting at the counter. We were hungry and had a full day ahead of us, so we eagerly agreed to counter seating. 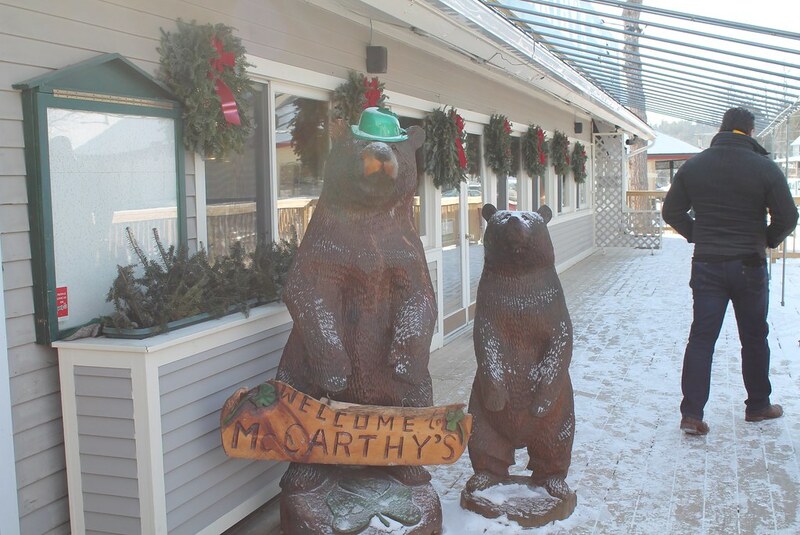 McCarthy’s is an Irish eatery meets ski lodge. The walls are covered in a tastefully joined story of Irish heritage meets skiing represented through mounted ski equipment and Irish keepsakes including a count down to St. Patty’s Day. I got the above view as we walked passed the register and knew immediately that I needed to make one of those sticky buns mine. They knew exactly what they were doing leaving that pan there. How adorable is that mug? 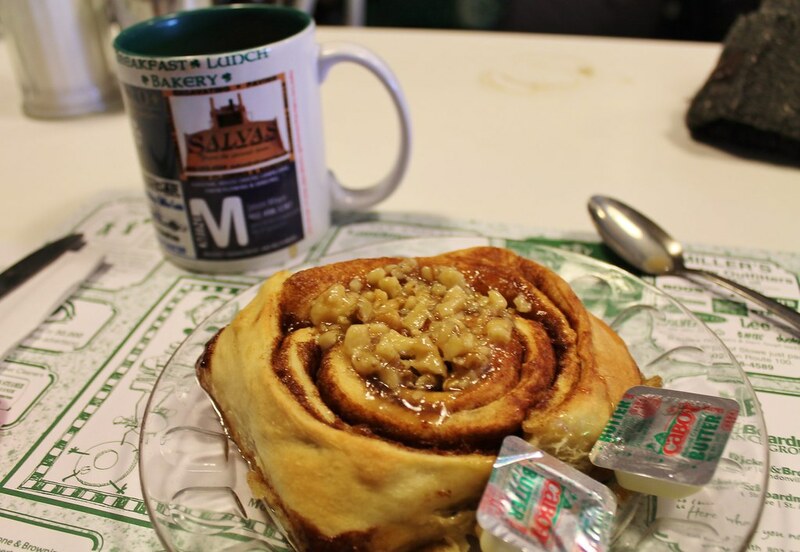 How delicious does that sticky bun look? Though it was nice to see them using locally made butter, this bun didn’t need it at all! It was divine all by itself and had me contemplating making a batch of my own at home. Our breakfasts* were farm freshly delicious. I went nontraditional for mine* and ordered their Woodchuck Omelette which was loaded with Granny Smith apples, Vermont maple sausage (my new love), and cheddar. The 12 grain wheat toast that came with it stole the show and despite how full I was, I ate every last bite of it. Lance ordered a short stack and a breakfast sandwich…both were beautiful and made me wish we had another breakfast to spare in Stowe. *You didn’t think I ordered only a little sticky bun for breakfast, did you? **If the sticky bun wasn’t clue enough, my vacation breakfasts normally consist of as many carbs I can get my hands on. 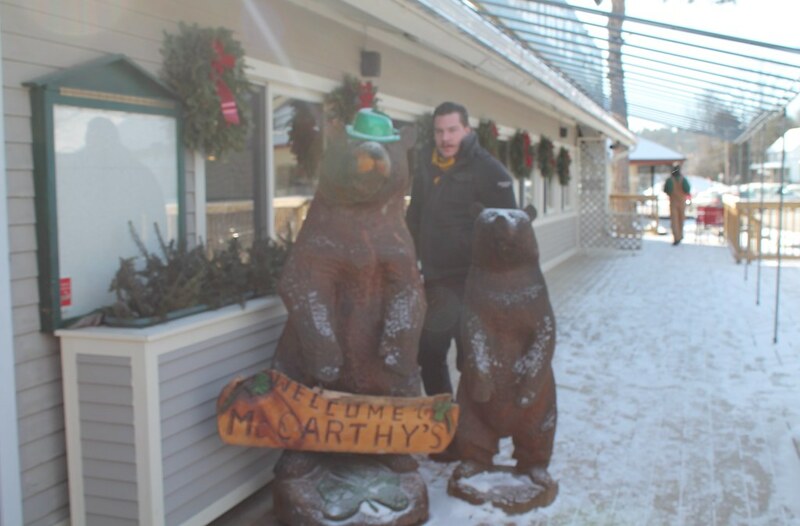 What most impressed me about McCarthy’s was their popularity not only among tourists, but locals as well. 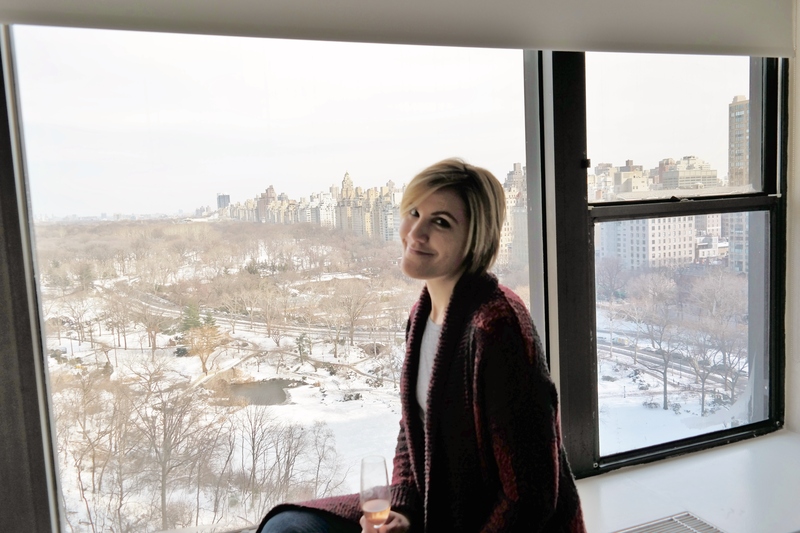 As we enjoyed our breakfast, most of the people seated in our area were lone guests, mostly males, who were there to grab a cup of Joe, and their usual. A pile of newspapers sat at the counter, of which most of these lone guests picked and chose from. 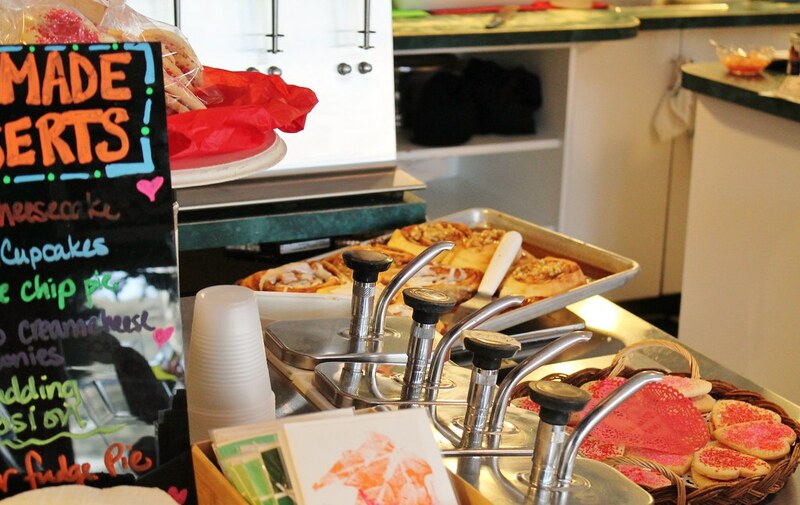 By the time we left, the line of hungry visitors waiting to be seated was to the door. And we were suddenly very thankful we arrived when we did.